A blog about the adventures of being a wife and mother of 4 very energetic children. 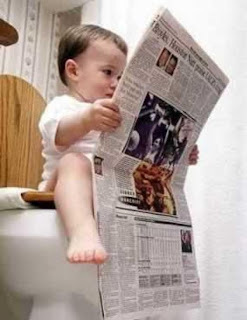 Wordless Wednesday and a potty trained 3 year old! I know I'm supposed to be wordless, but Duncan is potty trained! It's been a week since he's had an accident! That's one thing I can cross off my list. Here he is showing off his Hulk underwear. Okay, now back to being wordless. Today's blog hop is favorite kid pictures. I decided to post my favorite pics of Madi's 1st birthday. Enjoy! Yesterday was the first day of our fundraiser for Mandy and even though I got the post up late there were quite a few responses. We made $10 the first day! Unfortunately that was charged a fee by pay pal, so it comes out to $8.83. If you pay with a pay pal account or bank account there is no fee, but if you pay with credit or debit there is a 2.9% +.30 fee. Keep that in mind when you donate. I am so thankful that people are responding, I also have some great bloggers that are going to help me get the word out. Thanks guys! Lets keep it up, we're still a long way from our $500 goal, we'll get there with your help. Thanks so much guys! The response I got on the first day let me see how great the blogging community is. My husband's first question when I told him people were giving already was "who?" I told him I don't know them personally and he looked puzzled. In a way it is strange. In this day in age generosity seems to be a lost art, I started this thinking it was a long shot and no one would help out. Thank you for teaching me an important lesson about my fellow humans (bloggers in particular). You are keeping the lost arts of generosity and kindness alive. My good friend Mandy moved her family back in with her parents when her husband was unfaithful, and has been going through a lot of hard times dealing with the ending of her marriage and being a single parent, she knew the best thing for her kids was for her to stay home with them, her parents made enough money to support them all. All of us that love her did everything we could to help get her through the heartbreak, and she was doing pretty good until March when more heartbreak occured. I got a frantic call from her at 8 in the morning telling me her father collapsed early that morning and was in the hospital. All day I talked to family as his condition got worse, at about 9 o'clock that night I got the call I was dreading. He was gone. I called her the next day and asked her what I could do. She said "Please come to the funeral." I talked to my husband and booked the flight right away. Mandy was taking it REALLY hard, her dad was her rock, and with him gone she was lost. She felt abandoned, both of the men she counted on the most had left her. I hated to leave her like that, but I called her almost everyday and she surprisingly felt a little better after talking to me. I wish I could say that was the end of the sad part, but in the beginning of April she found out her 3 year old son Johnny is autistic. He's a great kid, and his Mom and Grandma are doing EVERYTHING they can to help him. He's in therapies and on a gluten free dairy free diet. Mandy isn't just my friend, in a way she's my hero. I have seen how hard she is taking her divorce and Dad's death, and yet she is an amazing Mom and puts Johnny and Natalie first. I hope to hear from lots of you. It may seem like a silly thing, but this is a much needed vacation for a great family, and with your help it could be nearly free for them in a time where money is very tight. One dollar or a link on your page(or both) is all I'm asking. Thanks guys. If this goes well I'd love to start a fund raising program for worthy causes that seem small, but mean a lot to worthy people. I am not a great photographer, and I don't always remember to capture the best moments, I'm working on it, but until I get better I'm going to use wordless Wednesday to showcase some great photos I've found online. There are so many, it's hard to choose. 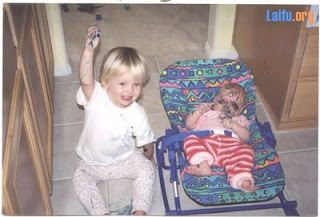 This week I decided to focus on funny pictures of kids. I can't tell you how many times my husband has suggested we duct tape our kids to the wall! I loved these pictures, let me know what you think of them. This week's blog hop subject was your favorite recipe. I love to bake so I had to choose a dessert. These are actually my husband's favorite cookies, and I love to make them for him because they are so easy to make and taste like you spent a lot of time and energy making them. 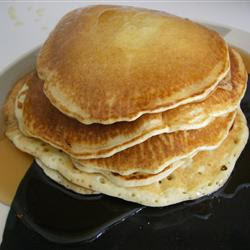 In a large bowl mix cake mix, oil, eggs and vanilla extract. In a separate small bowl mix sugar and cinnamon. Form cookie dough into 1 inch balls. 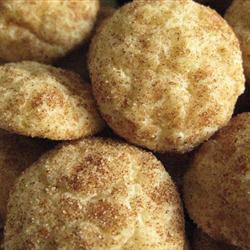 Roll balls in cinnamon-sugar mixture until completely covered. Bake @350 degrees for 8-10 minutes until lightly browned. This morning I woke up in a great mood. I got to read my bible for a few minutes and enjoy some peace before Duncan came downstairs and sat with me. It was nice to get some one on one with him, he's a pretty great kid, if I say so myself. We didn't get to hang out too long, Madi came down and joined us about 10 minutes after Duncan woke up, and Logan wasn't far behind her. They of course started telling me they were hungry mere seconds after they said good morning. My good mood gave me the idea to forgo our normal cold cereal or frozen waffles and make something myself. I asked the kids if they wanted pancakes and eggs, and immediately they started grabbing for their shoes, and Logan even asked if he could bring his shark with us. That's when it hit me that I don't make breakfast much if the idea of it makes them think we're going out for breakfast. It got more depressing when I explained I would make the food. They looked confused! The concept of a homemade breakfast baffled even my genius 4 year old that can read and write. So I've come to the conclusion that I need to make breakfast for my kids more often, and not just when daddy's home. It also made me wonder what else I don't do enough for my kids. I'm going to dedicate this weekend to spending time doing those things we don't do enough, that way Josh can join in too. I learn something new everyday, mostly from my children. Today the lesson started at and about breakfast, I wonder what I'll learn tomorrow...hmm. "Mommy" alligator and darker hair. Yesterday Logan was sitting on the couch with this alligator, (It's supposed to be a bath sponge, but it's huge, so I just let them use it as a toy)he was examining it closely and than looked at me with a strange thoughtful look on his face. After a minute his expression changed to one of excitement. "Mommy! "he all but shouted, "It's a mommy alligator!" I looked at him with a puzzled look. He could tell I was confused, so he explained, "It has your hair!" He didn't understand why I thought it was so funny, to him it was just a fact he had discovered. it has a prismatic effect in the sun, it turns a strange gold color. I just hope it lasts longer than the last color. It sure made a mess though! My bath tub turned bright pink and the skin on my back still is! That did not happen with any other dye I've used, so maybe this one has more staying power. Let's hope so because I love it. I came across this on a few other blogs and thought it was a great idea, I loved the blog hop I did yesterday, so why not unite with fellow bloggers again by showing a treasured picture every Wednesday instead of a lengthy word filled blog that I would normally do. Here's my first Wordless Wednesday picture: this is my favorite candid of my boys, they were getting along! I know I was shocked too, that's why I took the picture. Also right under this post I started a MckLinky. Add your blog to it, get us both more hits. blog hopping and 3 things you didn't know about me. I was browsing blogs last week and found this blog hop and thought it would be fun to join. This week the theme is 3 things you don't know about me. I thought about it a lot this week ,and I came to the conclusion that my blog is new and the few people that read it know all of the basic facts about me, and some not so basic, so I thought I'd dig deeper for this one. 1)As a kid I went to Seattle to visit my cousins every summer. I flew by myself every time, it was only a half hour flight. One summer my uncle dropped me off at my gate to go home and I gave the proper person my boarding pass and found a seat on the plane. I was sitting down for about 5 minutes before a stewardess came on board and announced the flight was going to Sacramento, Ca and that someone on the plane had used a boarding pass for a different flight. The boarding passes were so close in color that they didn't notice right away. Someone was nice enough to walk me to the proper gate and get me safely to Spokane. My mom still teases my uncle about trying to send me to California. 2)I think I hide it well, but I am very self conscious and insecure, I care too much about what other people think. I'm also very curious about how people see me. It KILLS me that my blog has been viewed almost 100 times already and I've only gotten feed back from a few. Comment or something PLEASE! I can take constructive critacism,no, I'm new at blogging, I NEED it. 3)Even after 5 years of marraige, my husband still gives me "the tingles" when he touches me and butterflies just by being near. Before you read my list let me explain it a little. We have lived in our house for almost 2 years now, when me moved in our house had no storage, the huge back yard was unusable and unfenced, we had a lot of crap and no place to put it. The only thing that's changed is now we have more crap cluttering up our house. It causes me a lot of stress, but I can't dissect and organize the house with 3 little people running around, at least that's been my excuse this whole time, but no more! As for the personal things. I know I don't use my time appropriately, even though I spend all of my time taking care of other people I still manage to be selfish, and no one is getting my best. I make all sorts of excuses as to why I can't spend more time reading my bible and praying, but none of them make sense. As I learned from Pastor Mike's sermon, I'm putting coins in a purse with holes in it. I spend my time reading other things, or watch tv, or surfing the Internet when I could be doing the things I swear I don't have time to do, the things that would be more purposeful and missional than what I have been doing. God deserves my best and from now on he's getting it, not just my attention once or twice a week. I know you can't read my chicken scratch and pens don't have a backspace so there's scribble marks. Not to mention my kids had peanut butter on their waffles this morning, the evidence it is in the right hand corner. I will make a readable copy, I am posting it on the right hand side as a list so it is always visible when you come to my blog. Again, thanks for your support, and please make comments and talk to me about my list often, help keep me in check. My middle of the night cry for help. I'm finding it impossible to go to sleep tonight. That's partially because my husband is snoring, but also because I've had some moments in the past few days that have made me realize there is a lot about my life I want to change. Change is hard for me though, I make personal decisions to do something and never followed through. I realized, as I was laying in bed listening to what sounded like an angry grizzly bear, that it's because I don't hold myself accountable. I need help with that part, which brings me to you. I know I just started this blog and not so many people have come across it yet, but I need some help. After my last post I decided that I would post my list of things I wanted to do before I was 30, but I've decided that can wait. I have a lot of things I need to do now that I haven't done. I have a number of good excuses, 3 of which are my children. I'm done making excuses. I am making a list of things I'm going to have done a year from now and I will work hard at achieving that goal because I am making a public proclamation. I will post that list for the whole of cyberspace to see, and then as I accomplish a task I will cross it off the list and let everyone know I am one step closer. It sounds silly I know, I'm hoping that I will have your support, because it won't be easy for me. It is late so I hope this doesn't sound like the rantings of a crazy person. I'm going to post the list tomorrow. Thanks for listening and I hope you all are having pleasant dreams. The one thing I don't like about having pink hair is the attention I get when I'm in public. I've never really liked the spotlight being on me, I have no stage presence, which is why I never could have made it as a singer. It always takes me a few seconds to figure out why people are staring at me, but what those people don't realize is their reactions to something as silly as pink hair says a lot about them. I've had a guy yell out of his car to tell me Jesus saves and I should change my ways. A little girl: "mommy look! Pink hair." little girl: "can I have pink hair?" mommy: "no, it's not normal." A different little girl stops me in the middle of a camping store and tells me how much she loves my hair, then runs back to her dad and says "look daddy, can I have hair like that?" I smile at him and say "sorry." He smiles back and replies "don't worry about it." He turns to his daughter and says "how about purple, that would be cool." an elderly man asked me if I fell into a paint can, I laughed and replied "No, I jumped!" I've had more than one person I know ask me "What happened to your hair?" when seeing it for the first time. I've had so many complements, many many people afraid to make eye contact, and others who treat me just like they would anyone else. I think the way we treat people that aren't just like us says a lot about our character. I'm glad I dyed my hair, I can check it off my list of things I've always wanted to do. It never ceases to amaze me how my children can find such delight in little things that we take for granted. We look at a video game controller and see it as a tool used to play games, a child sees it as a game in itself. A set of keys can be an instrument or a teether, a paper bag can be a hat. I have seen my kids eyes light up when they first see the simplest gadgets. Tape measures, can openers, sun glasses, lip gloss, and so many others, have caused my little ones jaws to drop. Things we never look at for longer than necessary provide youngsters with hours of enjoyment. It makes me wonder why we are always bored or need to be entertained by the television or computer when all around us are things that have such potential to be fun. We need to look past the convetional use and look through the eyes of a child. Look around you before you say I'm bored next time and you'll find a world of possibilities. 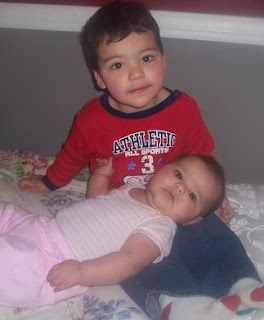 I have four great kids, their ages range from 5 to infant. I have an amazing husband who is worth all of the insanity kids bring. My life revolves around these 5 people, but in the off chance that I get some me time I like to spend it with the girls or chilling with a good book.